Advances in engineering continue to push modern skyscrapers to dizzying new heights, but at the core of these structures, quite literally, is an often overlooked technology that’s been key to their proliferation: the elevator. The earliest known reference to the elevator was by Roman architect Vitruvius, who reported that Archimedes built his first elevator around 236 B.C. The design was fairly rudimentary, a platform using pulleys and hoisted by hand or by animal. While elevators found their way into countless buildings and homes in the centuries that followed, including that of Louis XV who used a private lift to connect his Versailles apartment to that of his mistress, it wasn’t until the late 19th century that their true potential was unlocked. 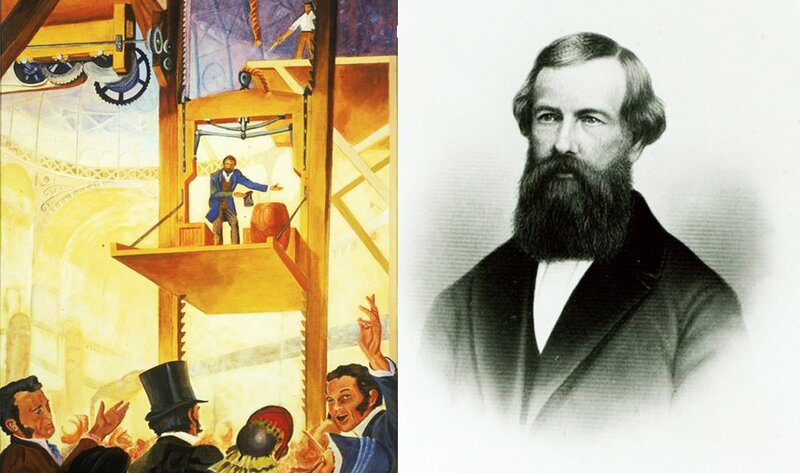 In 1853, American industrialist Elisha Graves Otis took to the stage at World’s Fair in New York to demonstrate his elevator safety brake. Otis had been working in a Yonkers, NY bedstead factory which required him to move heavy machinery between floors. Concerned with what would happen if the elevator’s support rope broke, Otis devised what he called a “safety hoist,” a steel wagon-spring meshing with a ratchet that ensured if the rope gave way, the spring would catch and keep the platform from plummeting and crushing everything below. Perched on a hoisting platform high above the crowd at New York’s Crystal Palace, a pragmatic mechanic shocked the crowd when he dramatically cut the only rope [with an axe] suspending the platform on which he was standing. The platform dropped a few inches, but then came to a stop. His revolutionary new safety brake had worked, stopping the platform from crashing to the ground. “All safe, gentlemen!” the man proclaimed. In the years that followed, demand for Otis’ elevators multiplied rapidly. His first public elevator was installed in the E.V. Haughwout & Co. department store at 488 Broadway on March 23, 1857, and in 1961 he patented a steam-powered elevator that could move up and down floors and brake immediately. Otis unfortunately died that same year at the age of 49, but his two sons, Charles and Norton, carried his vision beyond his death by establishing what today is known as the Otis Elevator Company—a name that can be found branded on thousands of elevators across the globe. 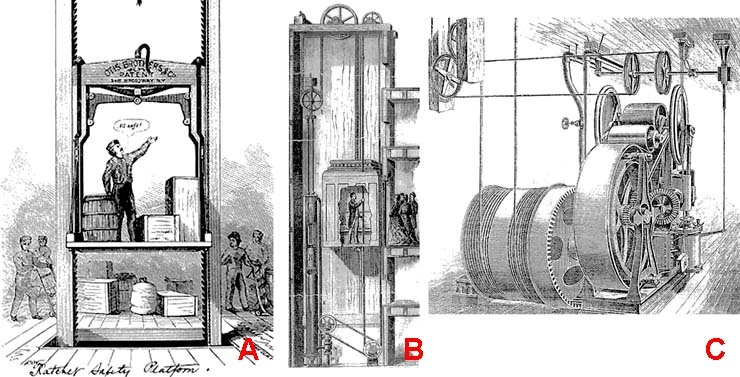 Although Otis’ design has seen numerous alterations over the last 150-plus years, the concept remains largely the same; multiple steel cables are used now instead of a single rope, there are clamps that hold the chain above and below the car to prevent it from moving too far in one direction or another, and today’s elevators also use electromagnetic brakes that close shut to prevent free fall if it loses power. The elevator is arguably a tall tower’s most critical design element when it comes to function, and Otis’ safety brake has enabled skyscrapers to both exist and continue to stretch higher into the sky. Surely Otis could not have fathomed the impact his invention would have modern construction.